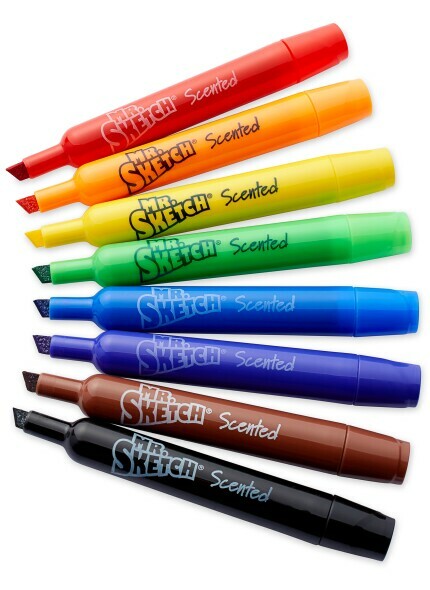 Mr. Sketch® is the original scented marker and continues to provide a fun, vibrant experience for kids. Each one of the bright, water based colors comes with its own unique scent, like Blueberry and Apple, to unleash students’ creativity. Recently introduced themed packs include Movie Night with scents such as Buttery Popcorn and Nacho Cheese, Ice Cream scented markers featuring Mint Chocolate Chip and a Holiday pack, with Sugar Cookie and Candy Cane scents. Mr. Sketch scented markers are available as both washable and non-washable markers with two tip sizes, which are great for drawing thick or thin lines and are perfect for sparking young artists’ imagination. Mr. Sketch is safe for children over 3 years of age.